The Nokia 1011 was Nokia's first GSM phone. It was also the first GSM phone to become widely available in the UK. The Nokia 1011 was not, as is often claimed, the first GSM phone. The British made Orbitel TPU 900 was launched a year earlier. The Nokia 1011 was based on the similar looking analogue Nokia 101 The name 1011 referred to the day and month of release: 10 November 1992. The Nokia 1011 was available in the UK with Vodafone's EuroDigital tariff. EuroDigital was the more expensive package, aimed at high end users. Nokia replaced the 1011 with the 2110 in 1994. This latter phone became the definitive Nokia phone of the early 1990s.The 1011 was a bridge between Nokia's analogue and digital phones. After 1994 Nokia focused almost exclusively on GSM, whereas rival Motorola continued with analogue. The Nokia 1011 can be used today, although you will not find the familiar Nokia tune. That did not come along until 1994, when Nokia replaced the 1011 with the 2110 as its top end business phone. In 1994, you would have had to pay £234 for one of these, but that price was heavily subsidised by Vodafone, keen to get customers hooked on the expensive tariff. Notice the diamond shape on the earpiece. This pattern helps tell the 1011 from the 101. This phone as also marketed as the Mobira Cityman 2000. 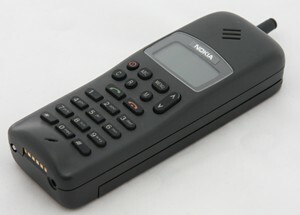 The Nokia 2010 is a more basic GSM phone from 1994, but similar in look and feel to the 1011. The near identical Hitachi CR-D300 is a clone of this phone. It was used in Europe from 1992. The only difference apart from the brand is a different pattern on the earpiece and different shaped keys. The firmware number of this version is NHE-2XH, presumably 'H' for Hitachi. Both phones were made in Finland. "Nokia's first phone was the Mobira Senator from 1982. Which was a car phone for the NMT (Nordic Mobile Telphony) network. The first phone branded as a Nokia was probably the Nokia Cityman 1320, which was sold from 1987 under both Nokia and Mobira brands. Nokia also sold the Cityman 100 from 1990. There is also a Nokia 100, which is a stripped down version of the Nokia 101. All these phones were on analogue networks. The first GSM phone made by Nokia was the 1011, the subject of this article. "I'm pretty sure I bought the first GSM Handset sold to the public in 1993. It is the Nokia 1011 and I still have it with the original manual. I purchased it for about ?600 from Caudwell communications, although my account number was G000007 they told me the previous GSM were car phones. It was a great phone and probably still is, but its hard to keep the battery alive. I still have the car set for it somewhere. "I want to purchase this old nokia 1011.how much can it be and when can it be delivered.